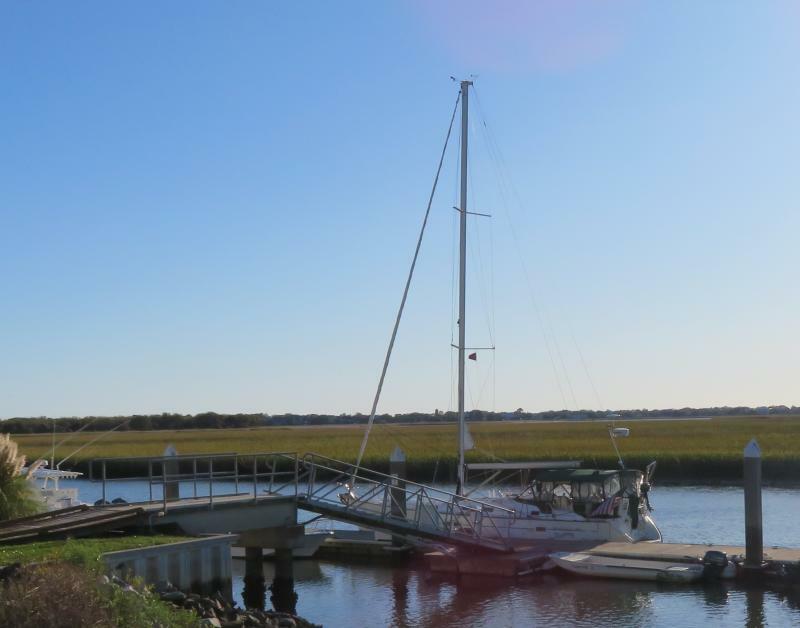 The day was so wonderful for traveling that we decided to push on to Jekyll Island and anchor after passing through the shallows. However, before I could do that we had to brave Mud River at dead, low tide. For the first time, I tried using Navionics' SonarCharts from their iPad app. To my surprise, it worked very well for predicting the depth to enable you to plot a path real-time. The only place it didn't do a good job was in the exit at the south end where the charts got mixed up and I almost came to grief. There were some 4.5 MLW spots along the way but the path was very narrow. If you deviated just a little from the best path, you found shallow water right away. I had my own problems. There was a stretch where you had to favor the green side, then the middle, and then the red side. I looked at that and in the heat of the moment, favored the red side first when it should have been the green side. Fleetwing came to a grinding halt! Now the problem was, where to go for deeper water. Well, the only route you know for sure that has deeper water is the way you just came in! So that involved some backing up and then the wheel hard left with throttle to spin the boat 180 and we left the shoal. I then relooked at my own guide which clearly stated that I had to run along the green edge of the channel which I subsequently did with success - the guide works - you just have to follow it! Along the way, we saw two boats hard aground as we passed by. 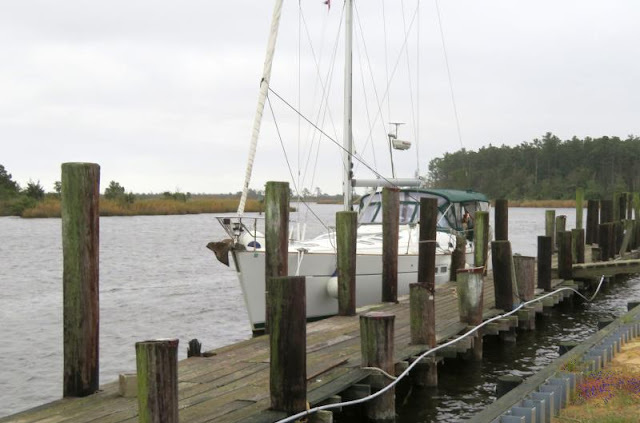 The problem area was at Altamaha Sound by R208 that looks very inviting for an easy pass. But you can't do that! You must run along the green edge of the channel to avoid a huge shoal working out from R208 where there is 20 feet at MLW. 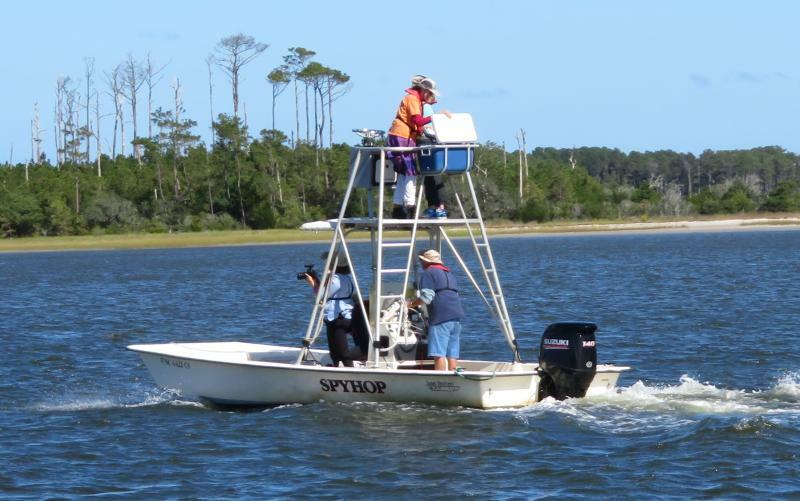 I still amazes me the number of boaters that don't even check Active Captain for shoals and just believe the buoys as gospel. Eventually they will learn their lesson (and then there's me who knew what to do but reversed the red/green side). Finally, we came to the Jekyll Island passage that seems to get shallower every year. We found one shoal spot that was only 3.3 MLW! We came through with 5 ft of tide so we passed over it okay. The night here is perfectly calm and we're the only boat in the anchorage. 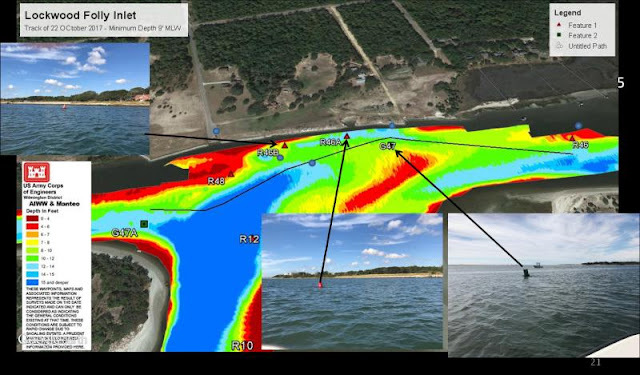 Again, if you don't read Active Captain you wouldn't know that the charts for the anchorage is wrong - they show the water to be too shallow. It's actually 8 to 10 ft and not the 4 ft listed on the charts. Information is available but you have to access it. All of this stuff is in my guide too. From here on out, we will have short days with leisurely breakfasts and relaxed starts. The weather is warm and the winds light. 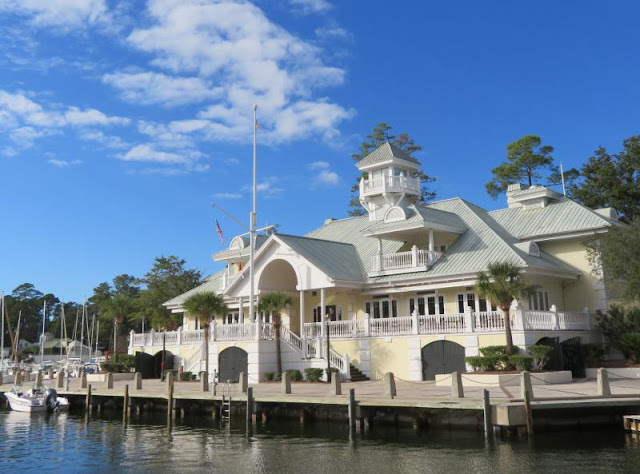 We will anchor out again at Fernandina where Ann has an appointment to get her hair cut at her favorite place, Magna's, and then we'll have dinner at another of our favorite restaurants, Pepper's Grill and Cantina. We timed our arrival at Hell Gate for a 4 ft tide but with the strong west winds, we didn't get as much advantage as usual. 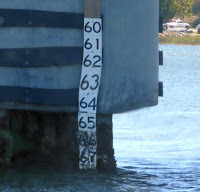 The Savannah tide station was initially showing a tide of 1.5 ft under normal to make our 4 ft cushion only 2.5 ft. As the day worn on and the winds lessened and the delta decreased to 0.7 ft which was still a lot but less than the initial 1.5 ft. That's the problem with reporting what you see through some of the shallow spots, it's hard to figure the tide effect due to wind unless you know where to look. 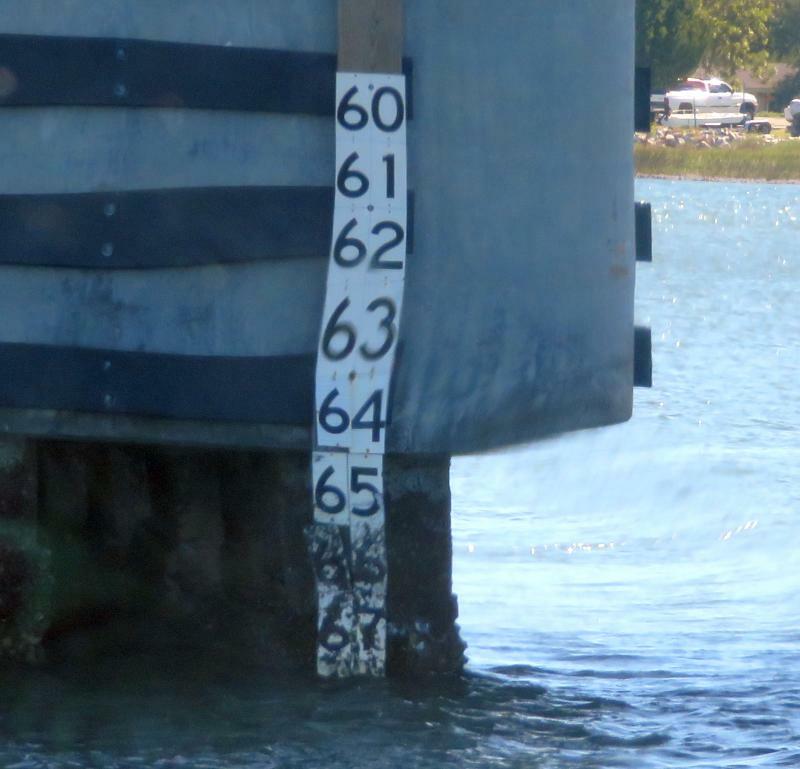 There are predicted vs actual tide stations all along the coast and they display their readings in real time on their websites. Here's a list of not only the tide vs predicted water levels but other useful links too. As far as Hell Gate was concerned, the GPX route worked for 4 ft MLW, Hell Gate has shoaled since the spring so you really need some tide to get through. Field's Cut was no problem with at least 7 MLW and mostly more all the way through. 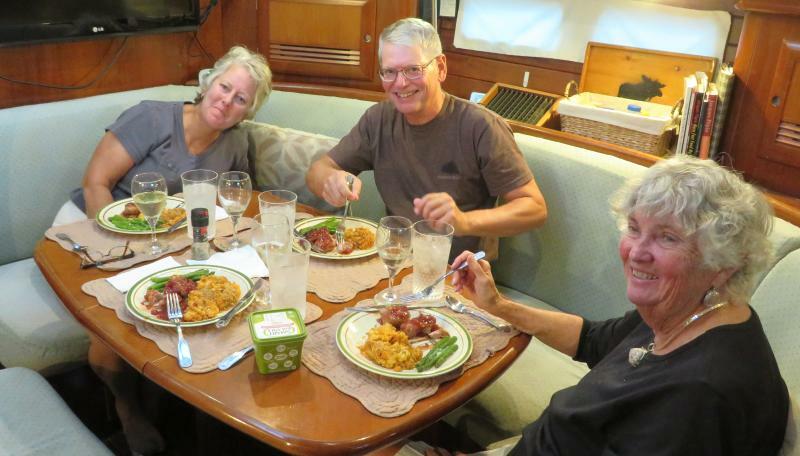 We had a delicious dinner and companionship with other cruising friends this evening. 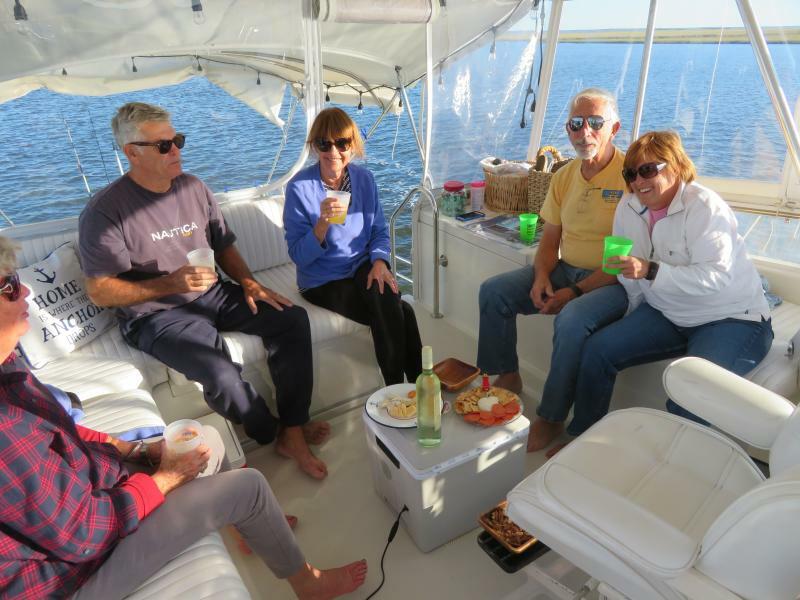 It's a great part of being on the water, meeting and enjoying the company of others along the way. I highly recommend the experience. On Tuesday we may anchor at Crescent River or we may go on to the Jekyll Island anchorage, it all depends on the weather and the progress we're making along the way. 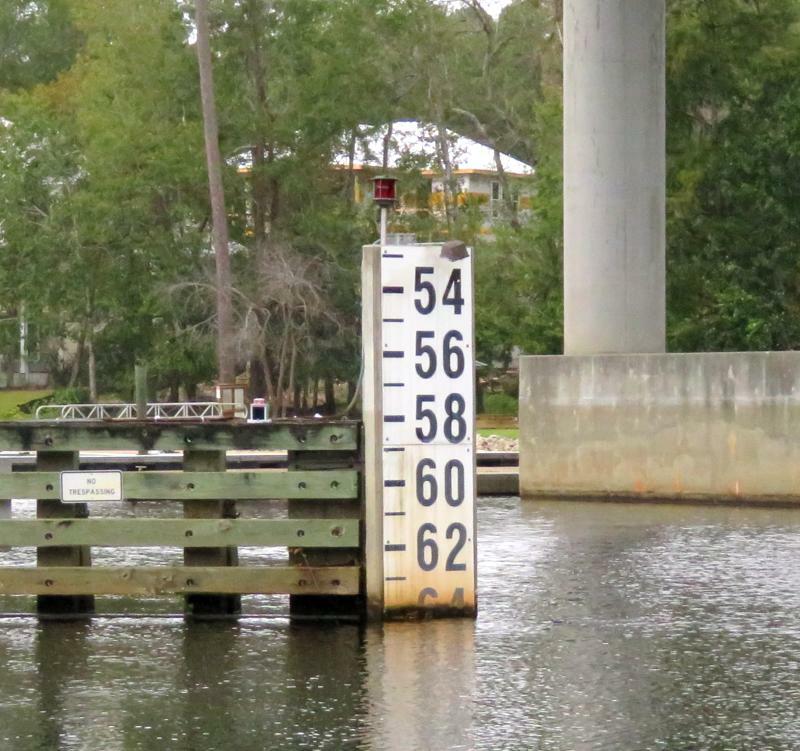 Alert - water levels at Savannah are running 1.5 ft below normal tonight due to the strong northwest winds. Expect that same delta at Hell Gate relative to the predicted tides. See links at left for current info. The winds came today, 20 to 25 kts with gusts to 30 and above. With that forecast, we just stayed in the marina where it was nice and calm. We are not in so big a rush that we have to brave less than optimal weather. We used the time to do our laundry, refill the tanks, and generally get ready for the rest of the trip to Titusville. I've received reports that Hell Gate is even worse than in the spring for shallow water. We are planning to go through with a 3 ft tide which ought to be enough but with the reports we've been getting, it may be touch and go even with our 5 ft draft. On that subject, I've completely redone the GPX Route link at the left of this blog. I've abandoned Google Drive for storing GPX routes and replace it with my own website as the source. So far, it has made a huge difference in downloading the GPX routes into the Garmin app on the iPad. All the routes now download without a hitch directly into the Garmin iPad app. One route everyone should have is BFernRed, It's a 9 ft MLW route through the famous shallows south of Fernandina. It's valuable because there are no buoys to direct you to the deep water path and there are shoals on all sides of the route. Deviate and you're in trouble but the GPX route makes it an easy passage. We plan on getting started around 8:30 am or earlier and will overnight at Kilkenny Marina which is on the other side of Hell Gate which we'll take with a 3 ft tide. Hopefully, that will be enough! We made it through Ashepoo without a problem since we had a 2 ft tide with us although without the tide we would have scraped bottom with our 5 ft keel. I remember more water in the spring but it was probably due to the increased rains in the spring. There's been no rainfall here for weeks. We came to the Beaufort swing bridge which is supposed to open on demand over a weekend. We asked , the bridge operator tried - but no go! There was some kind of a maintenance problem! So we did donuts as she called for maintenance. We saw people crawling around the structure and finally got the message that she was going to try again. We waited and waited - and finally the bridge did open, slowly. I don't know what the problem was but we got through! All of these bridges ought to be 65 ft. 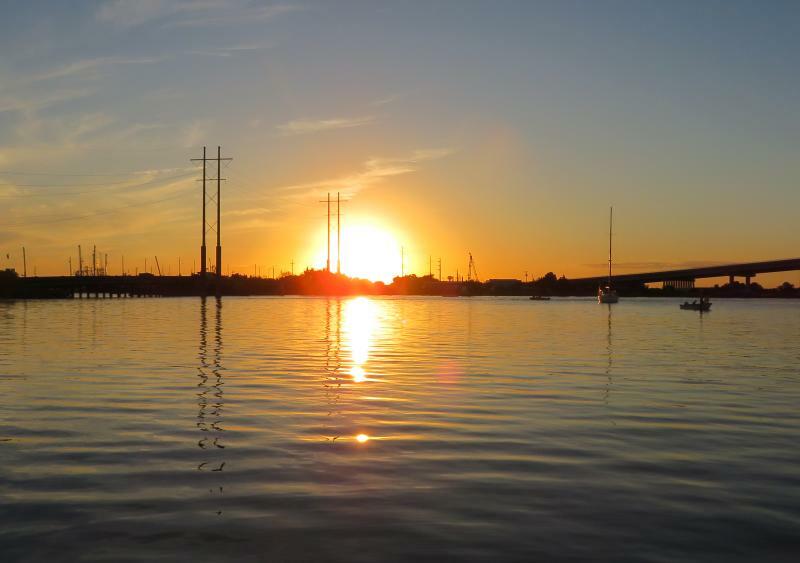 This is the first time we docked at Windmill Harbor Marina. The unique feature of this marina is the lock you must go through to enter the harbor. 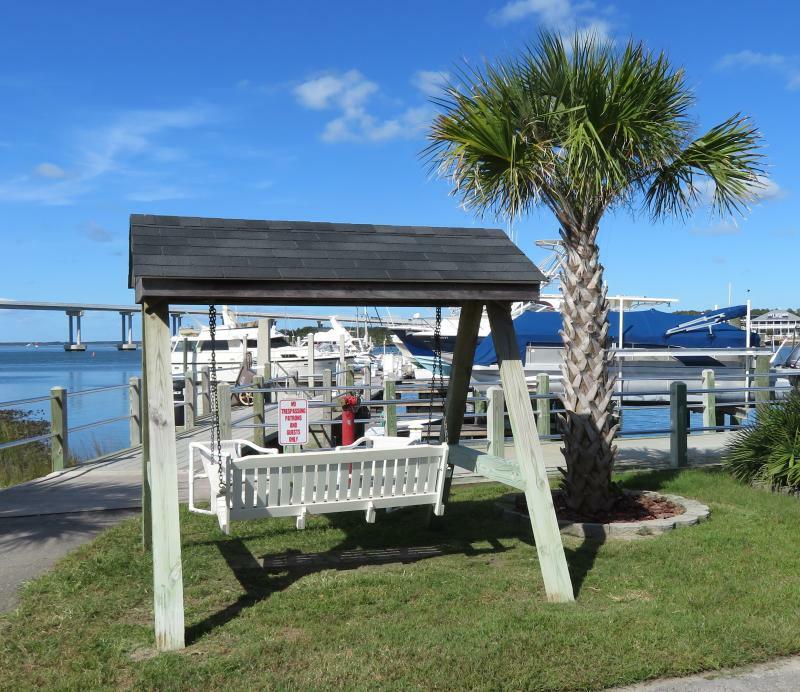 It's a one-boat dock and it keeps the water level in the marina at a constant depth. 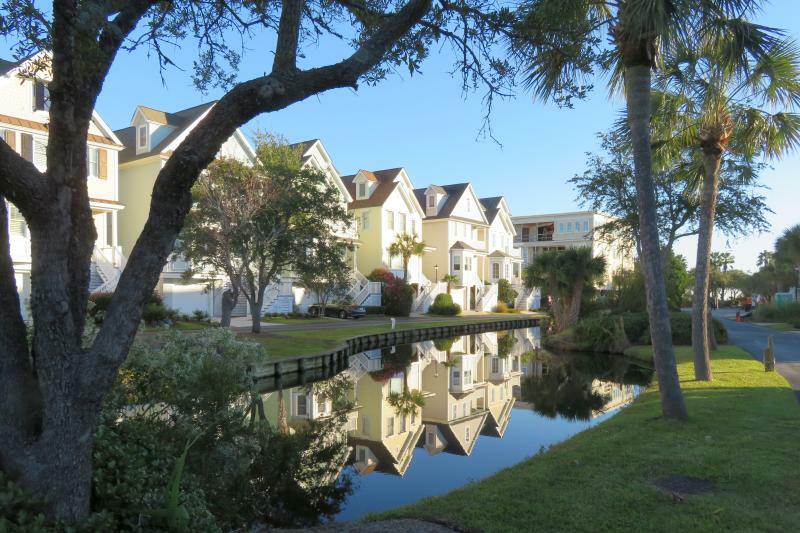 As you might expect, the marina is thereby totally protected from wakes and even the wind has a hard time getting into the marina since it's surrounded by three story homes on all sides. The remnants of the tropical storm coming up the coast will pass by us on Sunday bringing 20 to 30 kt winds but no rain. With that forecast, we'll probably just stay over in the marina another day and leave on Monday for Kilkenny. Why travel when it's not comfortable? Once we got started, it made more sense to push on to B and B Seafood. The water was perfectly flat, there was no wind and we had full sun in the cockpit. It was a perfect day for traveling. The shallow spots were, well, shallow! Dawho was not too bad but we did pass over a 5.2 MLW spot. Watts Cut was a little shallower yet with a 4.1 MLW spot. The passages seem have less water than I remember in the spring. Maybe it's the lack of rain and east winds. We didn't have any problems since we had plenty of tide behind us, over 3 ft most of the way. It's not a big place but they do have shrimp! B & B Seafood is located just before the Ashepoo-Coosaw cut off which is itself one of the shallow spots on the ICW. We will pass through it with a 2 ft tide and see what happens. Meanwhile, I paid the $25 for the dock (no electric unless you have a very long extension cord) and bought a pound of fresh shrimp. 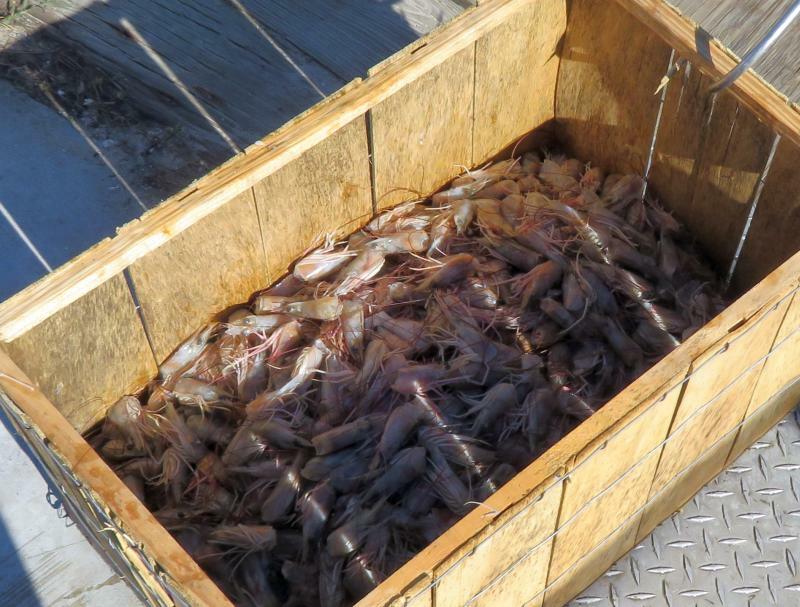 As we came in, one of their shrimp boats had just docked and they were sorting the shrimp inside - I got a fresh batch! We had shrimp for dinner! We will get a late start Saturday morning since we want to wait for a rising tide to tackle Ashepoo. We could probably plow through at low tide but that's more excitement than I want to experience. 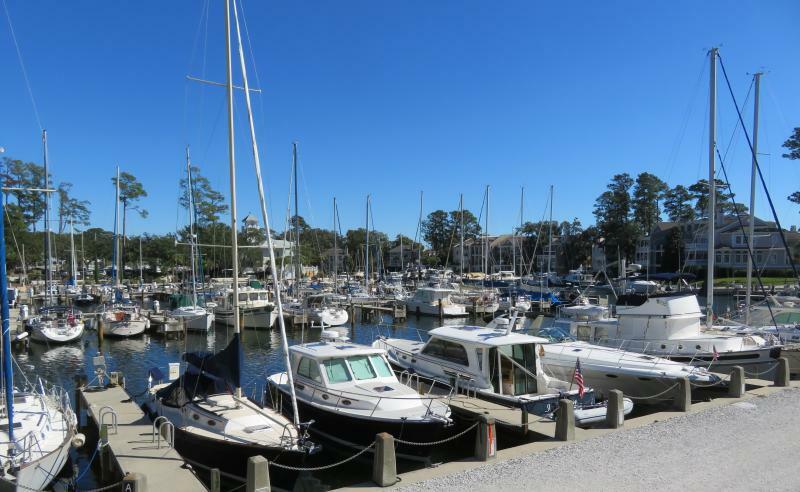 With the prediction of sustained good weather, we decided to target Windmill Marina on Saturday which is on Hilton Head. You have to go through a lock to enter the marina, a new experience for us. We've never been there before. The fair weather continues and we took advantage of it today to provision for the rest of the trip south. Toler's Cove offers free rides to the nearest supermarket for transients. We chose Harris Teeter which has a beautiful store in the area. From here to Titusville, we plan on traveling everyday unless the weatherman has other ideas. We will hit some of the shallow areas at pretty much low tide but the lows are still 1.5 ft over datum so it's not a low low. 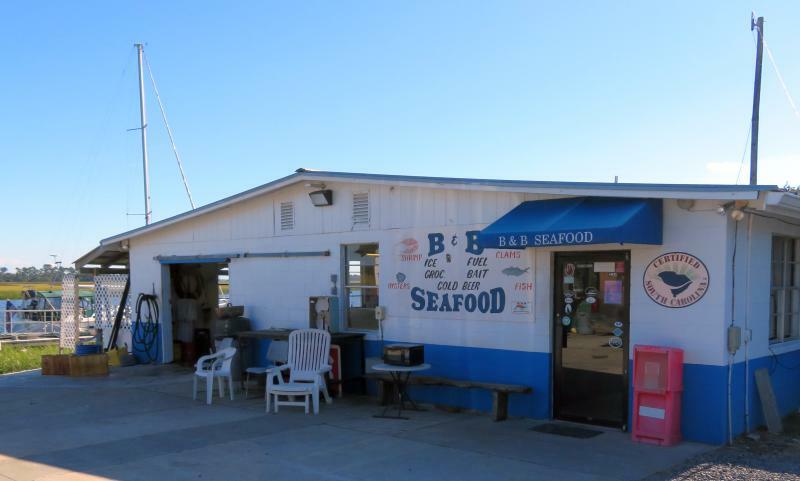 Our stop for Friday night will be B and B Seafood. Like RE Mayo, it's not really a marina but rather a shrimp dock that rents out extra space to transients. The price is right but there's no electric the last time we were there. What they do have fresh shrimp right off the boat. We always pick up a pound and have shrimp for dinner that night. We are in amongst the yellow grass. It's a nice place with very helpful dockhands. We left Georgetown around 8:15 or so and headed for the ICW passage through the Isle of Palms. This part of the ICW is notoriously shallow but we had done it before and found we could even make the passage at low tide with our 4 ft 9 in keel. However, that was not the case today where we were finding as low as 3.9 MLW in spots. Adding to the problem was the west wind. 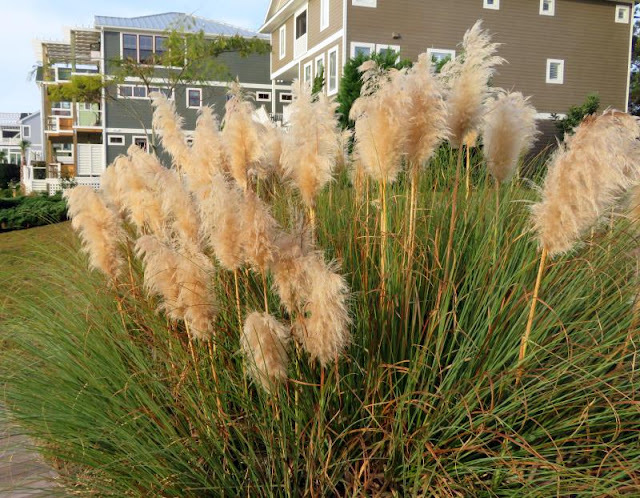 It will blow water out and lower the average water depth by as much as a foot. I use the Charleston water monitor to see how the water depths are running. It shows a graph of actual vs predicted water depth. The actual is shown against the predicted (from tide tables) and if the actual is less than the predicted values, then you can expect the water depth to also be less than predicted at nearby locations such as the Isle of Palms. Such was the case today which showed that the water depth was 1/2 foot less than the tide from tide tables. For an area like Minim Creek, that's a big difference! We timed our passage to have a 4 ft or greater tide so even so we found shallow water at MLW, we were fine with our 4 ft 9 in keel. Still, it was unnerving to find such a change from last year whien I routinely had 6 MLW. The last obstacle was to reach the Ben Sawyer Bridge before the 4:00 to 6:00 pm closure for traffic. We barely made the schedule, arriving at 3:45 pm and got through. 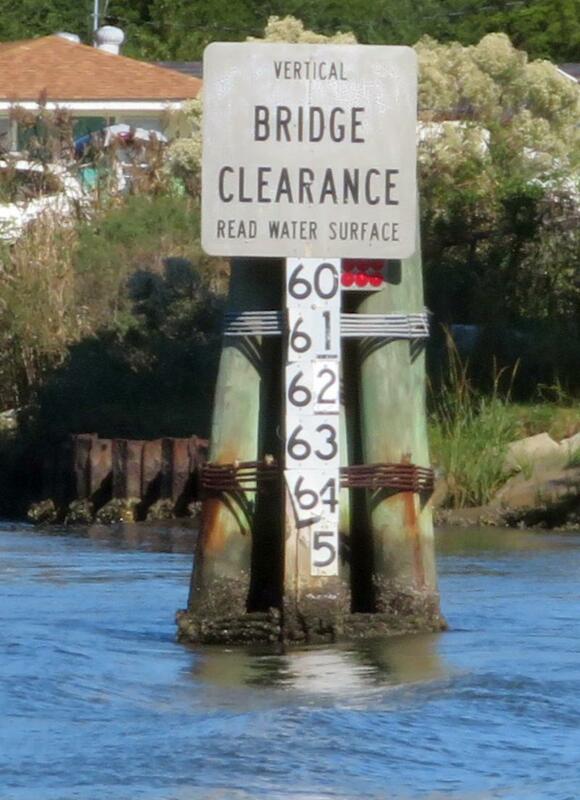 I can't understand it but we had an adverse current all the way from Minim Creek to the bridge. How can the current consistently flow against you through the changes from rising tide to lower tides and through all the inlets? Well, it was not enough, we still made the bridge on time. We will be here for another day for our last provisioning (marina provides a free ride) before continuing south. At least the weather remains pleasant although it has turned colder with the north wind. 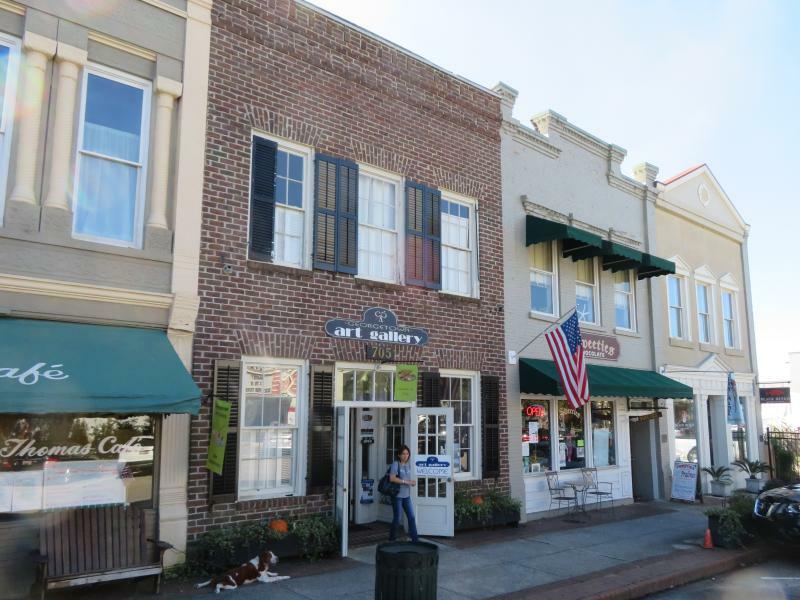 Georgetown was founded in 1729 and they've kept the character of the area intact. We took our dock yesterday at Osprey Marina bow in so this morning we had to go farther in and then find room to turn around. It was a little tight but with no wind and no current, not really a challenge. All the storms came through last night and today dawned with blue skies and fair winds. So our streak of fair weather days since Beaufort continues. We figure we have a month's worth of fair weather days in the bank after the terrible fall trying to get down here with all the hurricanes and other storms. The Waccamaw River from Barefoot Landing to Georgetown is beautiful. It goes through swamps at the northern end and opens up into a bay at the bottom. We know there are alligators in the fresh water river since we visited a plantation several years ago with a boat ride featuring their native alligators sunning themselves on the nearby banks. They tend to stay away from the main channel with its swift currents and reside in the streams coming off the main river. 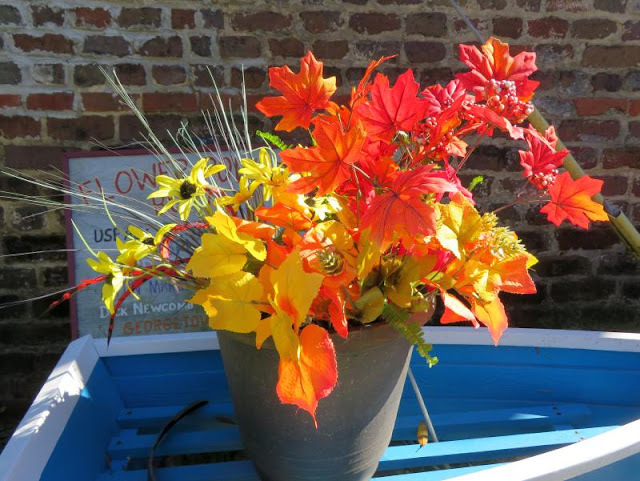 Autumn is in the air - time to head south! 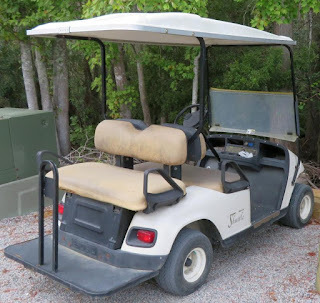 Today was a short day in order to get us positioned for a ride through the shallow spots of the Isle of Palms at high tide, especially McClellanville. We have reservations at Tolers Cove for two nights. They will take you to the nearest supermarket at no charge which we will use to provision for the rest of the trip south. I'll keep you posted on what we find in the Isle of Palms. We used to always stop at Barefoot Landing marina with all the shops. However, it's not what it used to be. It was taken over by a national outfit and they raised all the rents by 30% or more which resulted in many of the best stores leaving. So this year we just skipped the marina and went on to Osprey which is less expensive too at $1/ft. Osprey tried to go the extra mile and they have excellent dock hands. 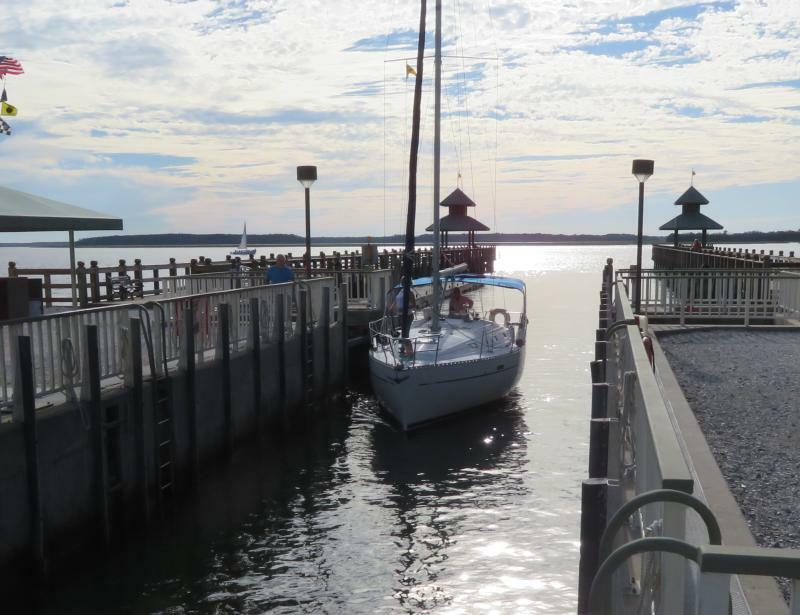 The marina added a long face dock that parallels the route coming in. It adds room for a lot more boats. The docks they added are first rate, made with IPE lumber - top of the line. 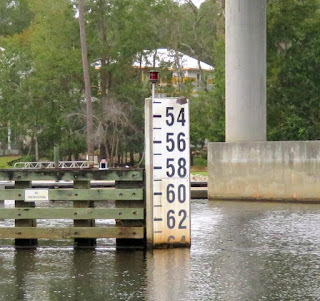 They just recently added an extension to the first face dock even closer to the ICW but they are having trouble getting electrical towers for the docks. It seems they are in great demand in Florida due to Hurricane Irma and they have been wait-listed. For those following trouble spots, both Lockwoods Folly and Shallotte Inlet are no problem. They have both been properly buoyed and all you have to do is just honor the buoys to stay out of trouble. For more details, just read my Active Captain posts I entered today. 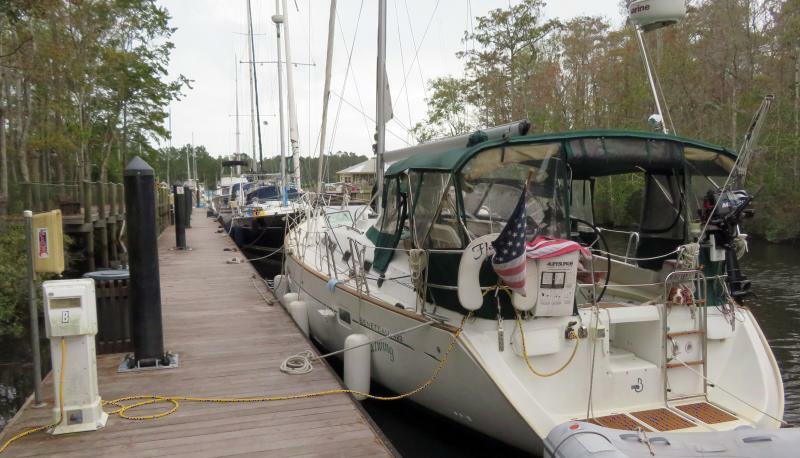 We are due for thunderstorms tonight but we're tucked in well and they are all supposed to be gone by morning.Then we'll head out for Georgetown and a dock in town to stage us for the Isle of Palms. The marina is part of the St James Plantation complex with over 4000 homes. They are all built to very high standards. 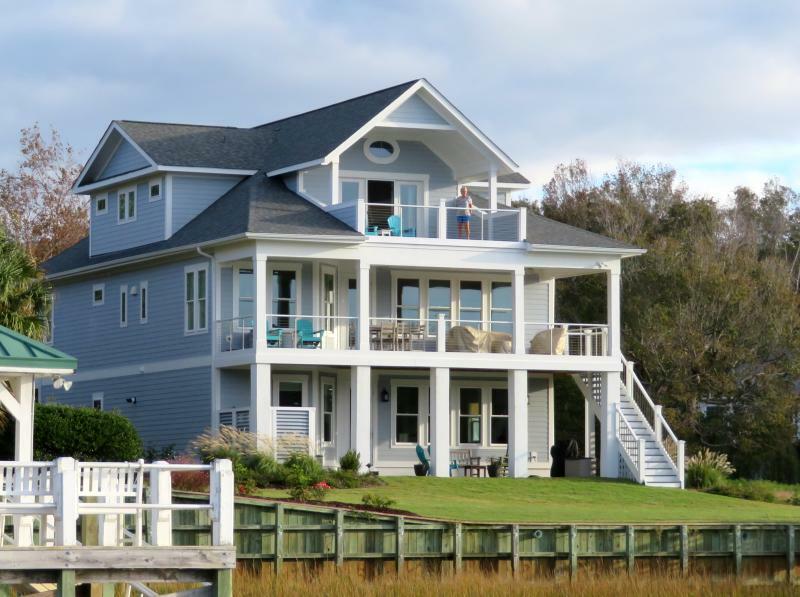 It's the most beautiful complex of this type we've ever seen along the ICW. If anyone wanted to retire to North Carolina, this is the place to be. We had friends over for dinner, Jim and Eileen McKay. They were the ones that took us in when Hurricane Matthew's eye went right over us. We were happy to be off the water during the height of the storm. 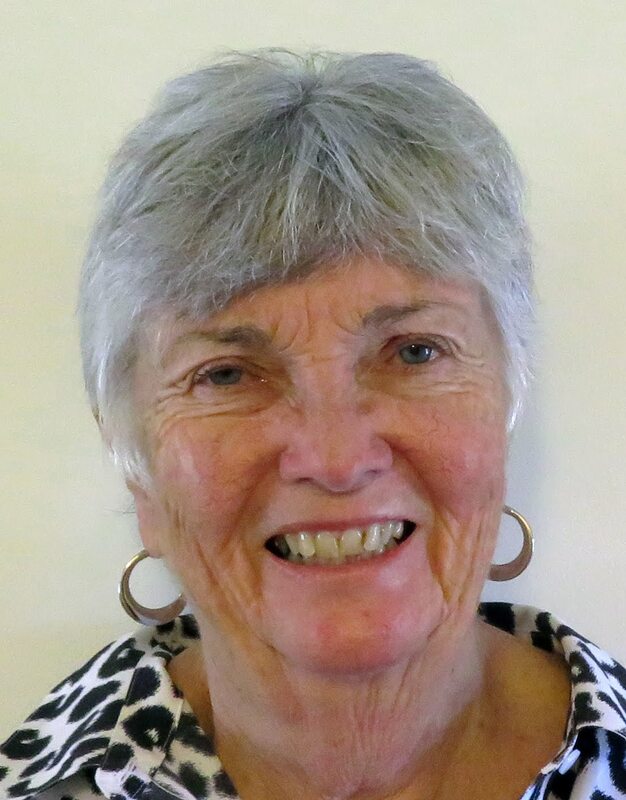 Ann did her usual magic and the dinner was outstanding. 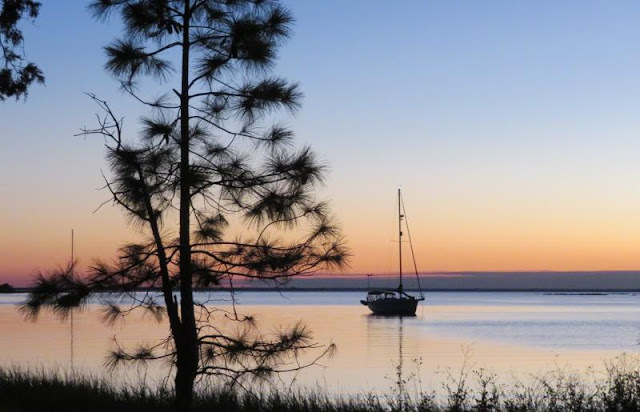 It was another wonderful day on the ICW.We've had so many windy, rainy, and stormy days that when they come this nice, it's a real surprise. The Surf City bridge only opens on top of the hour so we were ready for the 8:00 am opening and got right through. 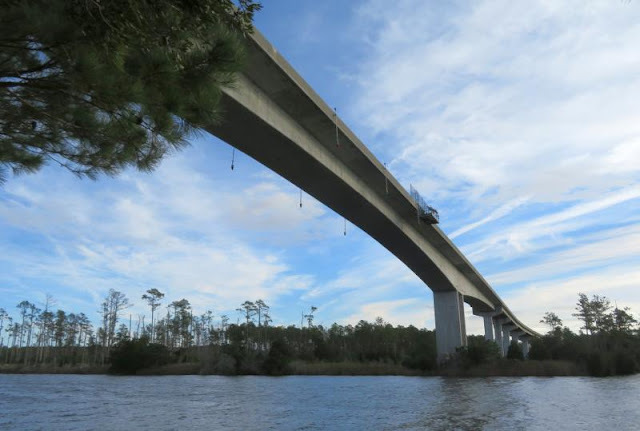 The next bridge, Figure 8 Bridge is not a problem since it opens every 1/2 hour. The real challenge is to make the Wrightsville Bridge which only opens on top of the hour and it's very hard to make since you have to average about 8 kts for the run. You never know about the tides, they can help or they can hurt. We had both this morning and in the end we were six minutes late for the bridge. However, there were no other boats so the bridge operator opened the bridge a little late just for us. We were thrilled! His consideration saved us an hour of waiting time. As we passed the inlets along the way, we either sped past at 8 kts or slowed down to 6 kts, depending on the details of the inlet. It's very hard to plan ahead for the tides along this route. Our trip today included a run down the Cape Fear River which is usually a bear of a ride due to the speed of the current and any winds in the area. Today it was totally tame. The winds were less than 5 kts if that and at one point we were doing 11.5 kts (which is a 4 kt current)! We will never have such a great ride again down the Cape Fear River as we did today. The standard could not possibly be exceeded. The view off the back of Fleetwing. 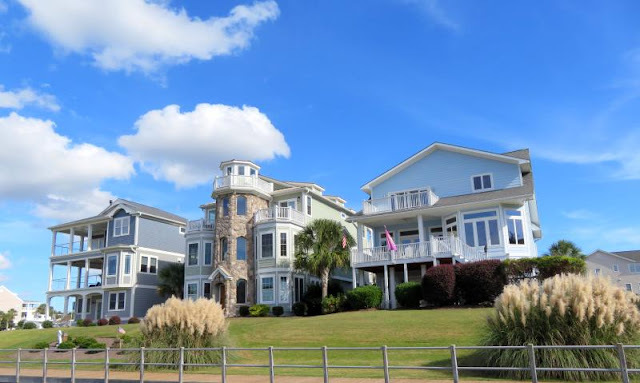 The clubhouse is at the left. They have an all you can eat buffet of salads and soup for $11! 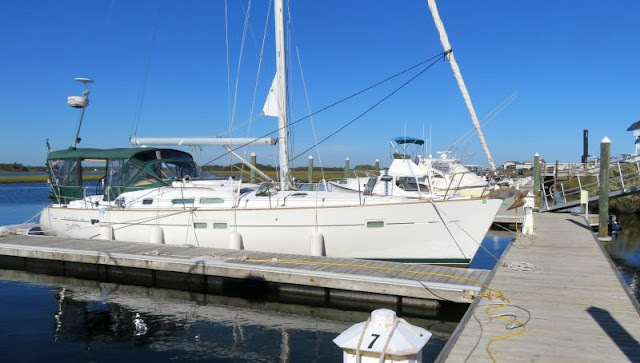 We are now docked at the St. James Plantation Marina which is private but they do rent out slips as they are available for transients. We were able to get one of the last ones they had. It seems we are in the midst of the fall migration and competing for slips along the way. The weather is trying to make amends for all the terrible things it did to us on the way down so we expect nice temperatures and less wind for the rest of the trip to Titusville. At least we can hope. 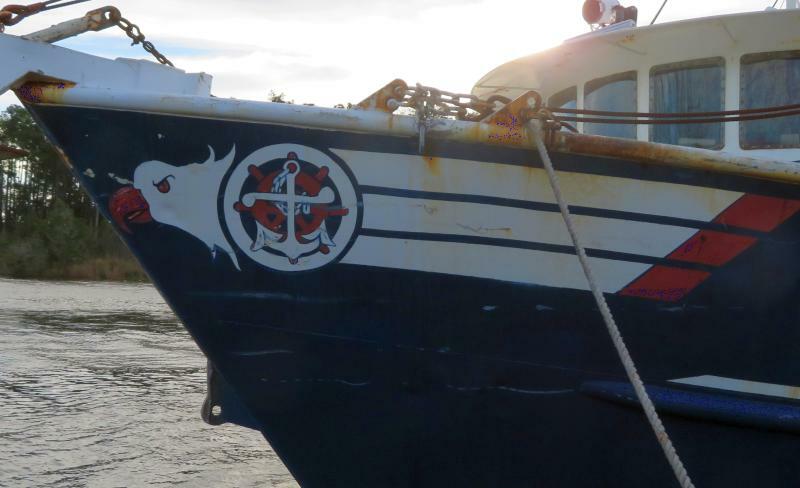 We left on a high tide and took the shortcut route out of Beaufort which carried 6.3 MLW although it's marked with a shoal icon on Active Captain. That saved us about 1/2 hour at least. The current was with us on the trip south with speeds up to 9.2 kts! It was another beautiful day, a rarity on our trip south this year. We ran through Brown's Inlet without a problem by favoring the red side of the channel. There's shoaling to 3 MLW on the green side. The surprise was at the next inlet, New River. The ACOE survey was not accurate. I found out that it was replaced with a new one on the very day I went through the inlet. I ran into a 5 MLW shoal not shown on the old survey but was shone on the new one dated 10/20/2017. Since I draw only 4 ft 9 inches, I survived the shoal without touching bottom. I updated Active Captain for both inlets. Other than the two inlets, the rest of the ride was fine. 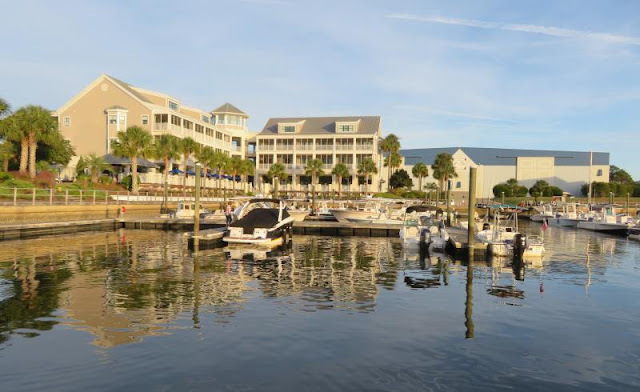 Surf City is again open for business and has been renamed Topsail Marina. The owner is not on the premises so you pay over the phone and he assigns you a slip in advance. The docks are 40 ft long and easily accommodate our Fleetwing. There's no current and very little wind, at least today. Surf City still has the IGA store in town for minor provisioning which is very handy and, of course, there's tons of restaurants to visit if you're in the hunt for one. Don't forget the fish market just up the street if you desire something from the sea. On the other hand, the Wrightsville bridge will be close on Saturday until 10:00 am due to an Ironman event so we'll be delayed there too. 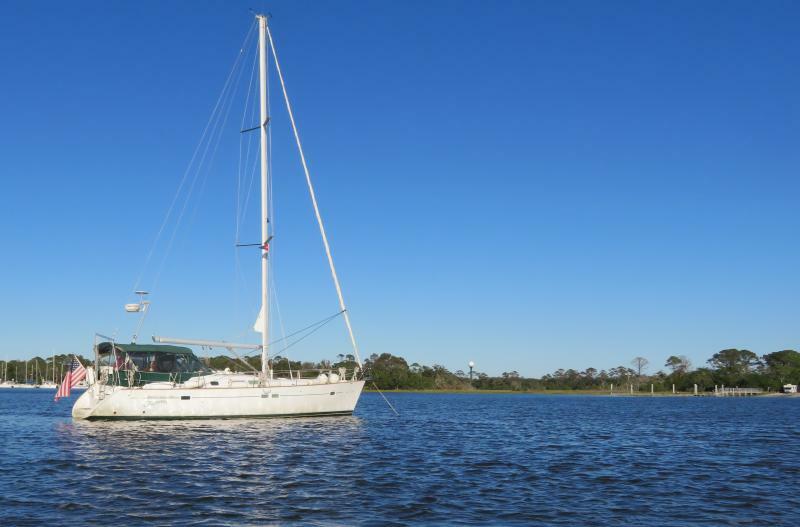 We are aiming for St James Plantation marina for Saturday night for a two night stay, then it's on south again if the weather holds. 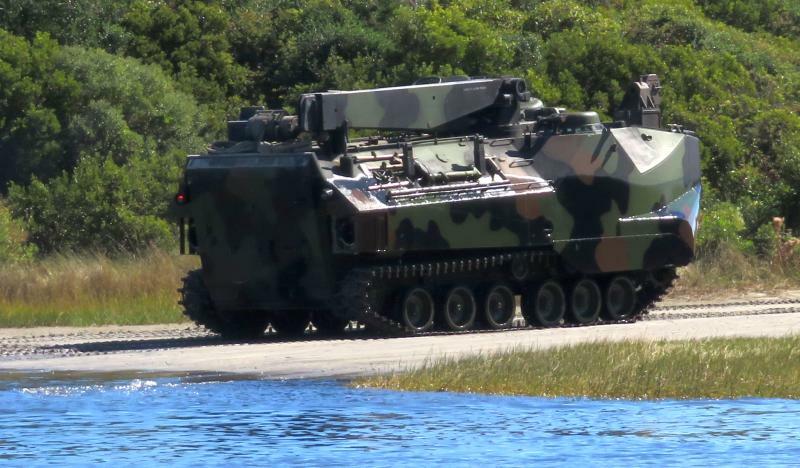 We heard today that the Camp Lejune live firing exercises would not restart until 10/24. If that holds up, then we're good to go for tomorrow, 10/20. 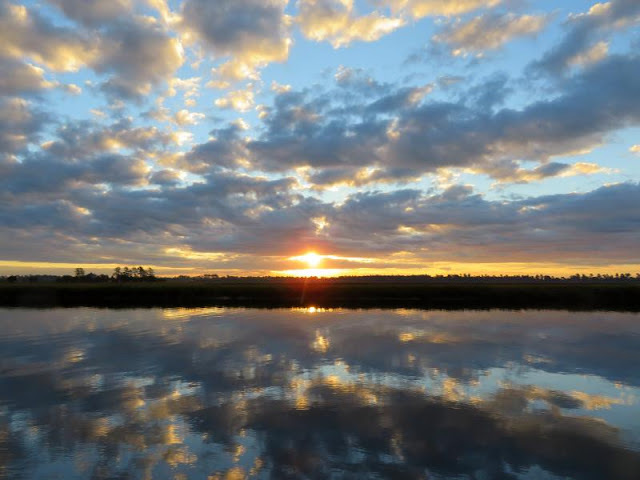 Along the way we will pass through two of the shoaling areas for the fall of 2017, Brown's Inlet and New River. the shoaling in Brown's Inlet has just developed over the last two months. Up until then, it was just a straight shot through.You can see from the survey that you have to stay to the red side of the channel to avoid the shoaling that extends into the channel from the green side. New River has the same "dip route" it had in the spring. I've included GPX routes for both the New River and Brown's Inlet passages. I will be taking both of them on Friday so I will be able to comment on how good the waypoints are. Meanwhile, we've provisioned at s Lowe'Food (no connection to Lowe's Home Improvement stores) which was a step up from the usual fare. Now we're good for a couple of weeks. Last night Homer Smith came through in the clutch with 2 lbs of trigger fish which was just wonderful. It tastes very much like grouper, nice. We will be taking a shortcut tomorrow on the way out of the marina which is supposed to be good at high tide, we'll see. After that, we're headed for Surf City. It will be the first time we've visited there since the last marina went bankrupt. They are now reopened under new owners and we will see how it is. It's close to the ocean and a walk iin the evening to the beach was always a treat. The stop also positions us for the 7:00 am opening of the Surf City swing bridge the next day. We hope to make it all the way to St. James Plantation the next day. That sailboat at right has been stuck there for about an hour, waiting for high tide. You have to watch your depth coming in. 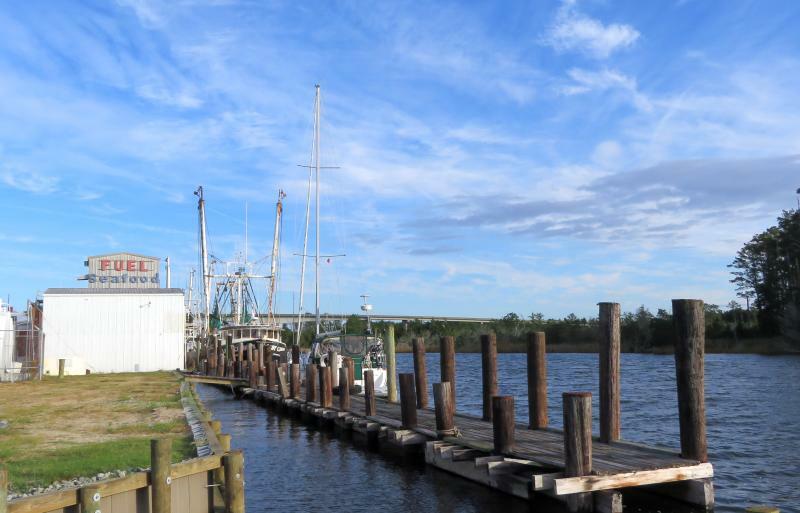 That said, the shrimp boats that carry 7 ft do just fine, just stay in the channel. The winds finally calmed down to around 15 kts out of the northeast so we headed out down the Neuse River. It's a shallow body of water that can really kick up if you try to go against the wind but that was not the case today as we had the wind behind us most of the way. We used to anchor at Cedar Creek but them we discovered Homer Smith in Beaufort. He has first-rate docks and the marina is within walking distance of downtown Beaufort.The washer and dryer are free and there's a courtesy car too. Fresh shrimp is available since the marina still hosts a shrimp fleet. 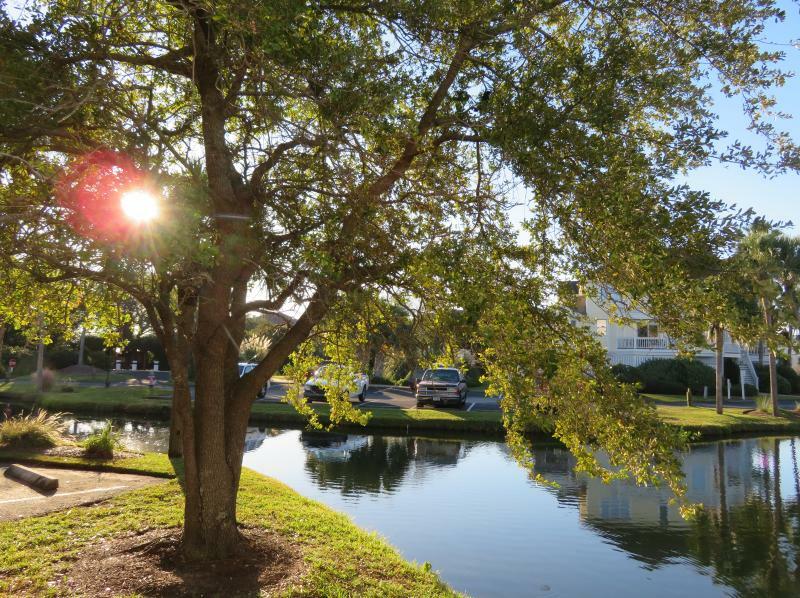 It has become one of our favorite marinas. 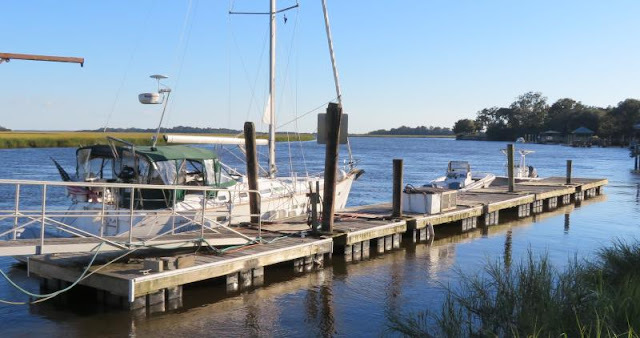 To reach the dockage area of Beaufort you can depart the ICW and take the east branch of the channel in the area known at the "confusing area" where the ICW take a sharp turn to the west. You even appear to take one green buoy on the "wrong" side, the Russell Slough Junction Light RS. It's painted green but it's a junction buoy which can be passed on either side. We passed it on the east side when heading south into the channel leading to Beaufort. We will be here for another day for provisioning before heading south again. We'll have to call Camp Lejune to find out the story there. 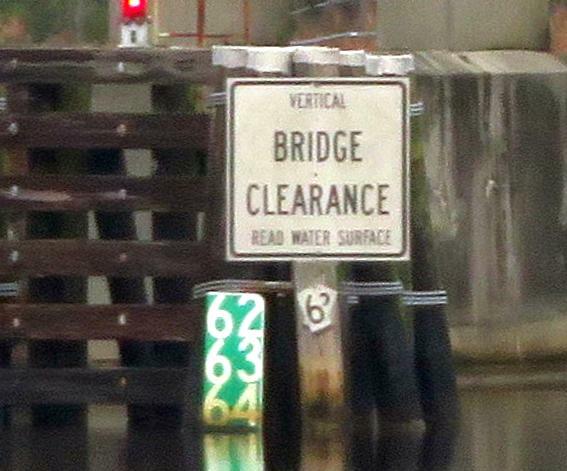 Meanwhile, I continue my quest of taking a photo of every bridge height board along the way. We rode out the high winds today (20 to 25 kts) at the RE Mayo docks. We like to travel comfortably. If all we wanted to do was get from point A to point B we'd be in a car. 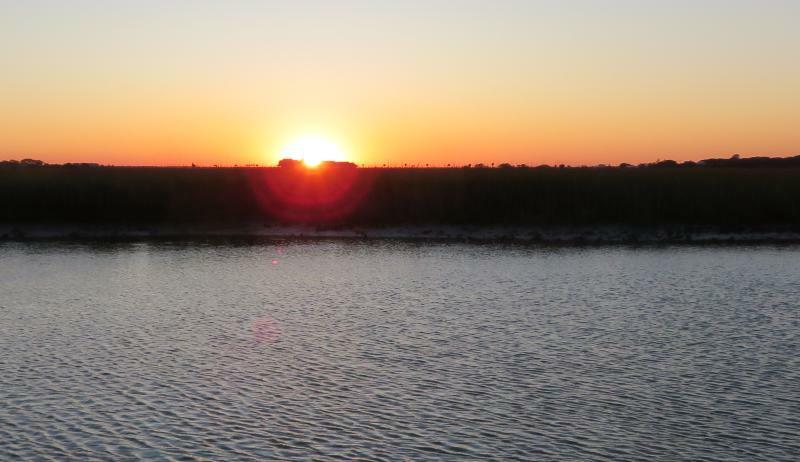 We enjoy the experience of the ICW and stopping often along the way to see the sights. We refuse to be on a schedule, a deadly thing for traveling on water. The weather rules, your desires are secondary. Today we stocked up on frozen seafood which RE Mayo has in frozen blister packs. It's very convenient for stocking up your freezer. Today we concentrated on shrimp, grouper and crab cakes. 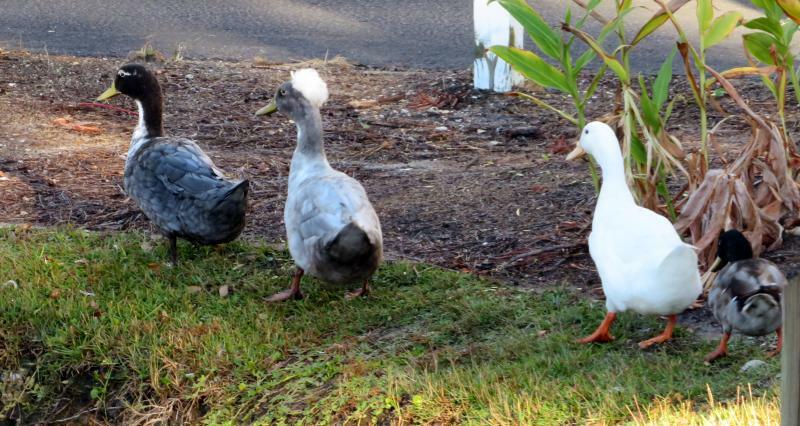 I think we will be passed by the captains that attended the Snowbird Rendezvous since we stop so often along the way. Several passed up today headed south. No matter to us, it's the trip along the way that matters to us, not so much the destination. It's interesting to walk along the docks and see all the huge shrimp boats. There were six docked here today. They keep their boats in good shape, all painted and looking good. They all have their own bow insignias on the bow. It seems to be a point of pride on a good painting there. I took a few pictures. John Kwak passed us by today headed for Oriental. On Wednesday, we're headed for the Homer Smith Marina in Beaufort, NC. We plan on a two day visit to do laundry and provision for the rest of the trip south. By Wednesday, the winds are predicted to subside to 10 to 15 kts, manageable from the 20 to 25 kts of today. Then we'll see about getting through Camp Lejune and their live firing exercises. We had heard (incorrectly) that you needed to give a two hour warning to the Alligator River Bridge before passing through it. A friend traveling with us called the bridge number at night and left a message that he wanted to pass through at 7:00 am the next day. So with that, we decided to take the same opening. At this time of the year, 7:00 am is barely light but we arrived on-time. We also learned that the start of bridge maintenance had been delayed until 10/30/2017, two weeks from now. The two hour notice requirement came out in a Notice to Mariners from the Coast Guard. I still don't know if that's true but it didn't apply to us since the construction work won't start until 10/30. There were winds of 25 kts and greater forecast for later in the day which was another reason for the early departure. Once underway, we decided to make for RE Mayo instead of the Pungo anchorage. RE Mayo was 65 Nm distant and we didn't arrive until 3:30 pm, just before the rains started. The winds were as predicted around 20 kts but they were all aft of the boat so the ride was fine. We found the docks empty (you just come and dock, there are no reservations) and plugged into the only 30 amp outlet. This is not a real marina. The docks are worn to say the least and there's only one electrical outlet. On the other hand, the price is right at $0.40/ft including electric. 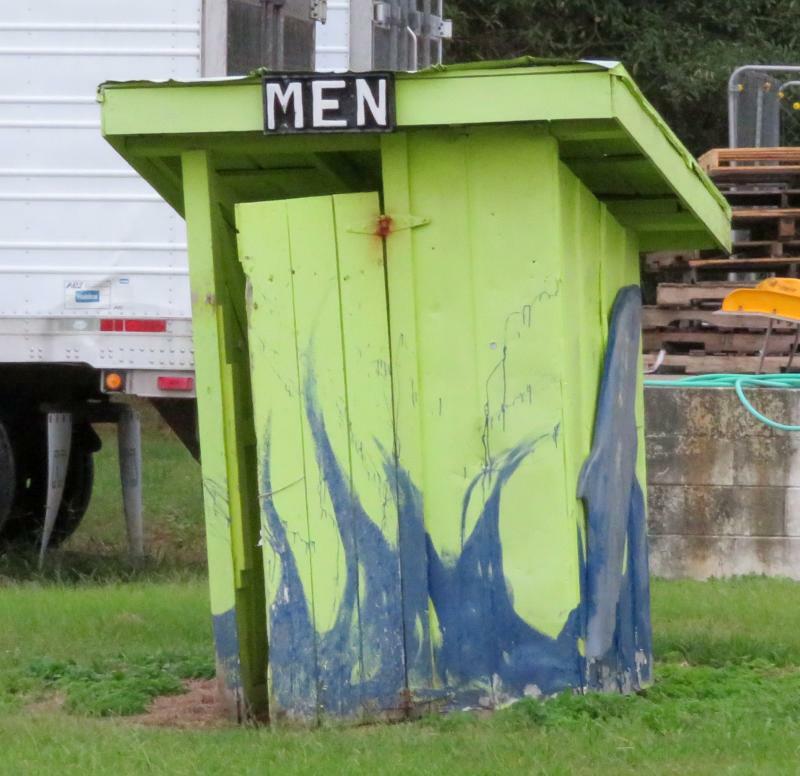 The bathrooms are outhouses, there are no showers. But it is a good place to stock up on frozen seafood. 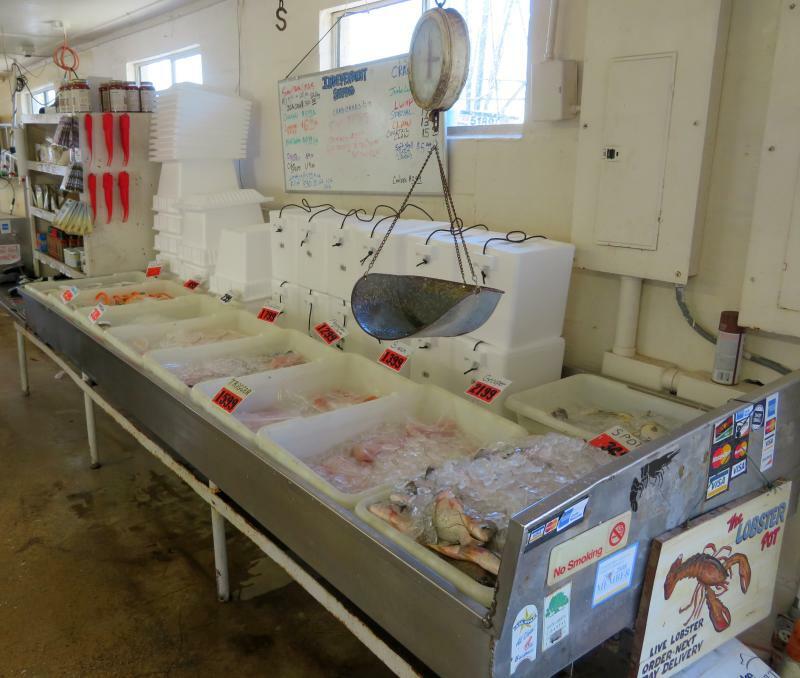 Specifically shrimp, scallops, and flounder - all caught locally. 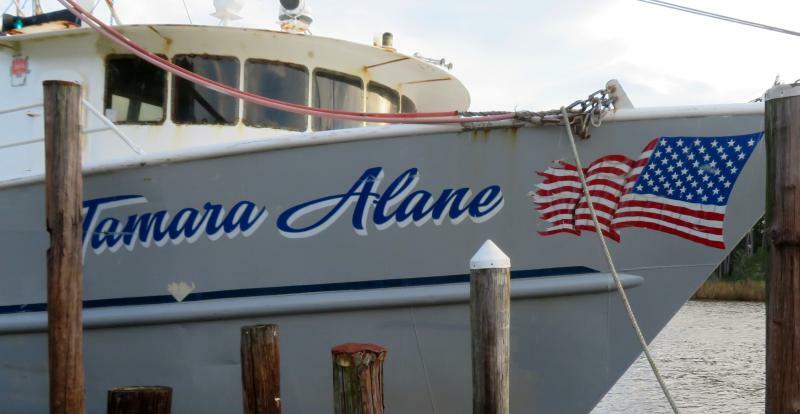 The place is home to four very large (60 ft) shrimp boats. 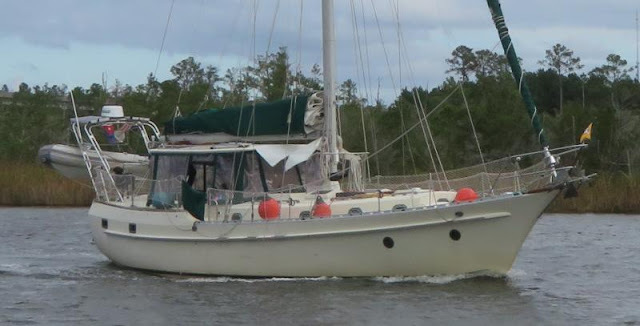 So we are tucked in for the night and probably for the next few days since 30 kt plus winds are forecast for the Neuse River on Tuesday, not good conditions for going down the Neuse. 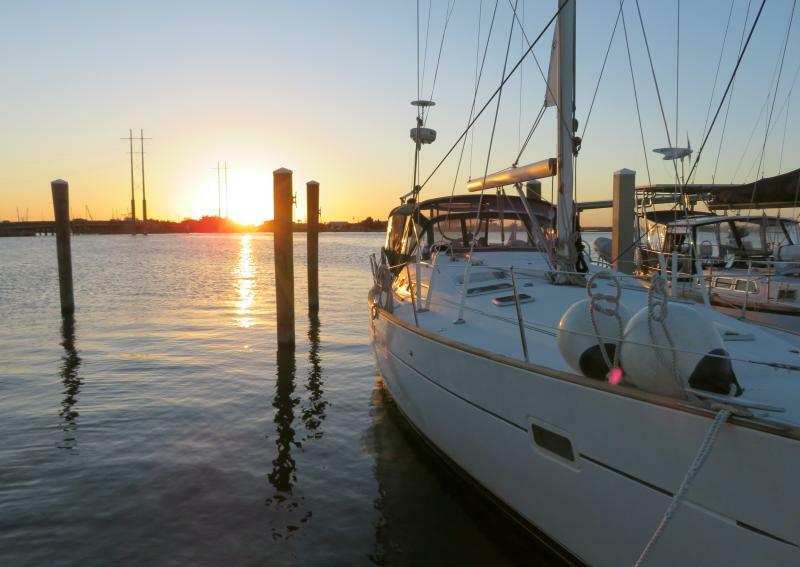 Our next stop will be the Homer Smith Marina in Beaufort. 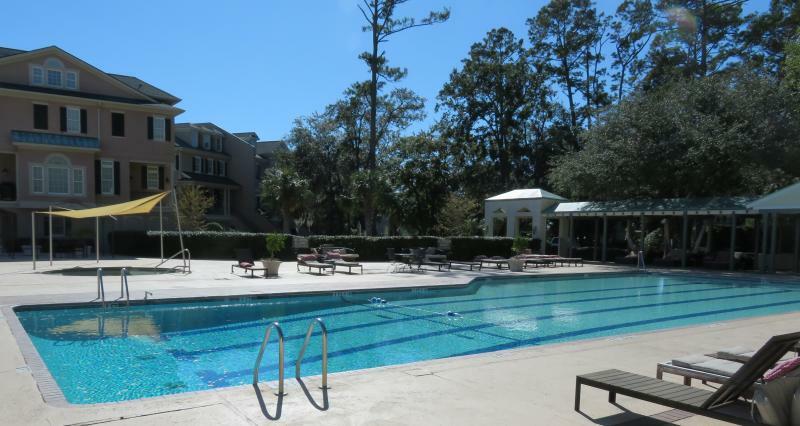 A message to first time ICW travelers: this weather is not normal! 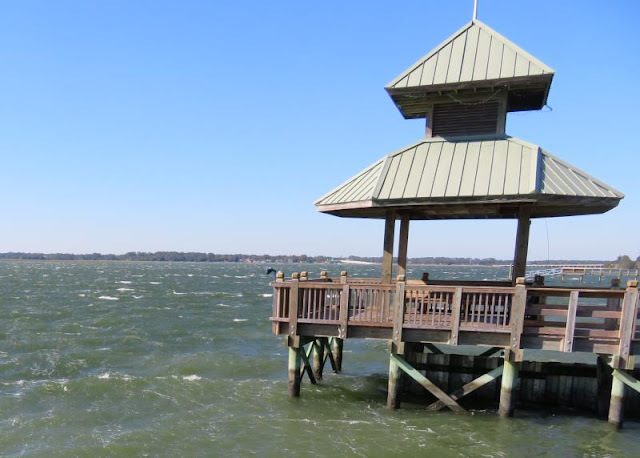 For the first seven years of our travels on the ICW, the weather has usually been warm and the winds light (well, except for hurricane Matthew last year - was that a start of a trend?) So don't be discouraged by this year's weather. It's been much too cold and windy.